​The Xunantunich Archaeological Project (XAP) was a multi-disciplinary research and conservation program directed by Richard Leventhal that began in the summer of 1991 and continued with annual field seasons through 1997. The original conception of the project lay in the hands of Belize’s Ministry of Tourism and the Environment and the Department of Archaeology, which advocated a combined approach involving scientific investigation and architectural consolidation. In the late 1980s and early 1990s, the government of Belize sought to develop tourist attractions, and Xunantunich, easily accessible and located on the road to Tikal, was targeted for development. In 1991, Acting Commissioner of Archaeology John Morris extended an invitation to Richard Leventhal to direct those efforts. Leventhal’s archaeological investigations were designed to understand the rise and fall of the Classic Maya center of Xunantunich and its roles in valley and regional politics. Although the project’s research efforts initially focused on the Xunantunich site center, Leventhal recognized that understanding ancient Xunantunich required studying the polity as a whole. To gain a regional perspective, Wendy Ashmore was invited to co-direct the project and develop the Xunantunich Settlement Survey (XSS) to study the polity’s hinterlands. Its research questions focused on the factors that influenced hinterland settlement choices; how they changed through time, especially in reference to the late and rapid florescence of Xunantunich in the Late and Terminal Classic periods; and the degree and nature of integration between Xunantunich’s rulers and hinterland residents. A significant component of XAP was the development of the site for tourism. The Castillo and its famous eastern plaster frieze were in urgent need of repair. With the aid of the Getty Conservation Institute, researchers undertook scientific studies and offered advice about how to preserve the eastern frieze and the newly excavated western frieze. It was determined that the deteriorating condition of the Castillo’s friezes was due to the salt content of the stucco and limestone used in the construction, and that it was impossible to leave the original friezes open for public viewing. Getty consultants and Rudy Larios V. supervised the construction of a fiberglass replica of the western frieze. It was completed during the 1996 field season, and the western frieze was reburied to preserve the original sculpture. Str. A-6-1st and A-6-2nd superstructures also were stabilized and new consolidation work undertaken including A-6-2nd’s substructure and Str. A-1. XAP also built storage facilities, a visitor center, and a stelae house that still contains the site’s monuments, as well as Actuncan Stela 1. Previously, the site’s three carved stelae lay under a thatch roof in Plaza A-I. 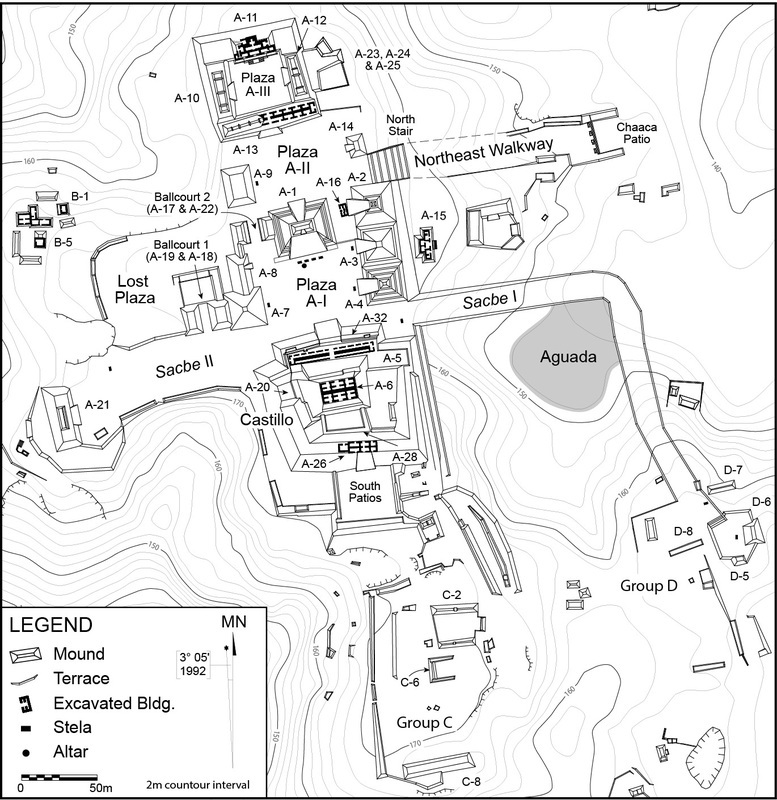 Map of Xunantunich (from LeCount and Yaeger 2010: Fig. I.1). Braswell, Jennifer B. 1998. Archaeological Investigations at Group D, Xunantunich, Belize. Ph.D. dissertation, Tulane University. Connell, Samuel V. 2000. Were They Well-Connected? An Exploration of Ancient Maya Regional Integration from the Middle-Level Perspective of Chaa Creek, Belize. Ph.D. dissertation, University of California, Los Angeles. Keller, Angela H. 2006. Roads to the Center: The Design, Use and Meaning of the Roads of Xunantunich, Belize. Ph.D. dissertation, University of Pennsylvania. McGovern, James O. 2004. Monumental Ceremonial Architecture and Political Autonomy at the Ancient Maya City of Actuncan, Belize. Ph.D. dissertation, University of California, Los Angeles. Neff, L. Theodore. 2008. A Study of Agricultural Intensification: Ancient Maya Agricultural Terracing in the Xunantunich Hinterland, Belize, Central America. Ph.D. dissertation, University of Pennsylvania. Preziosi, Aimee M. 2003. Patterns of Style, The Ceramic Record and Community Differentiation: A Study from Xunantunich, Belize. Ph.D. dissertation, University of California, Los Angeles. Robin, Cynthia. 1999. Toward an Archaeology of Everyday Life: Maya Farmers of Chan Nòohol and Dos Chombitos Cik'in, Belize. Ph.D. dissertation, University of Pennsylvania. Sanchez, Julia L.J. 1997. Royal Strategies and Audience: An Analysis of Classic Maya Monumental Art. Ph.D. dissertation, Anthropology, University of California, Los Angeles. VandenBosch, Jon. 1999. Lithic Economy and Household Interdependence among the Late Classic Maya of Belize. Ph.D. dissertation, University of Pittsburgh. Yaeger, Jason. 2000. Changing Patterns of Social Organization: The Late and Terminal Classic Communities at San Lorenzo, Cayo District, Belize. Ph.D. dissertation, University of Pennsylvania.